Aalto Executive MBA: What a ride! 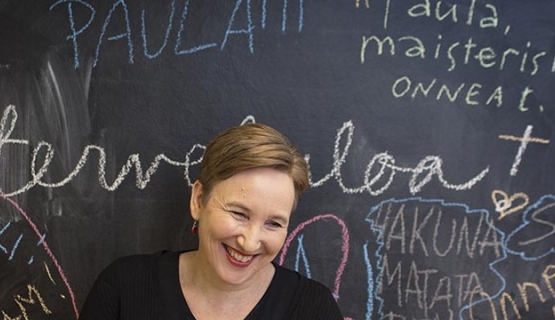 Journalist and entrepreneur Paula Salovaara says the most valuable asset she gained from her Aalto Executive MBA years were the friendships. The day our class met for the first time for the introduction, everybody got to say a couple of words about themselves and about what they expected from the program. We heard that most people in our cohort run weekly marathons while working with demanding jobs and managing their private lives, with and addition of some cultural hobbies to fight the boredom. After an intimidating list of achievements every one revealed the true reason for applying. We all said: I am here to find new insights. Maybe the biggest insight is the certainty that there will always be more to learn, and that new knowledge sure makes you feel good. But still, I think we gained something even more valuable as a group. In the introductions, the bravest of us said they expected to meet interesting people and learn about different ways of thinking. Networking was surely mentioned, it always is. Not a single one of us stood up and said: I would like to find a new friend. To get a new friend is the grandest thing that can happen to a person. I would not dare to get up in front of 50 people and tell them that I lust for your friendship. But in the oddest of moments, in the midst of producing exhausting amounts of power points, friendships emerged, as they do. I would like to thank Aalto University for building such a wonderful platform for friendship. Thank you for all the knowledge we were offered, while getting to know each other. But most of all I would like to thank my classmates. Thank you for finding the time to talk about all matters in life while figuring out the fluctuations of world trade. We will miss our time together, we will think fondly of the gatherings, we will even miss writing the business project for the fifth time over. Anybody can network, there is an easy formula for that. Smile eagerly, talk lightly, shake a hand, drop a name, offer a coffee. The formula gets much more complicated, when you have to solve problems together, ask for help when feeling dumb and miserable, and when you get up together to present the results of a job that took many months to finish. Everything gets so much more interesting, when the small talk is over. Our cohort moved swiftly over to big, long and loud talk. Our modules have been much about discussions. We have completed at least 20 modules, with the topics ranging from project management to how to influence other people. Right next to these modules there has been the invisible module of learning to know people, their families, their jobs, and bosses, loves and sorrows. Edited from a speech given at the Aalto EMBA graduation ceremony held in Helsinki, November 2014. Paula Salovaara is a journalist, entrepreneur, and mentor based in Helsinki. She is a founder of Radio Helsinki and has nearly 30 years of experience in various Finnish media. She is a former Editor-in-Chief of Radio Helsinki and Managing Editor of Helsingin Sanomat. Currently reading: Aalto Leaders' Insight: Aalto Executive MBA: What a ride!